Create stunning slide-show or animated screensavers within minutes with Ace Pro Screensaver Creator. 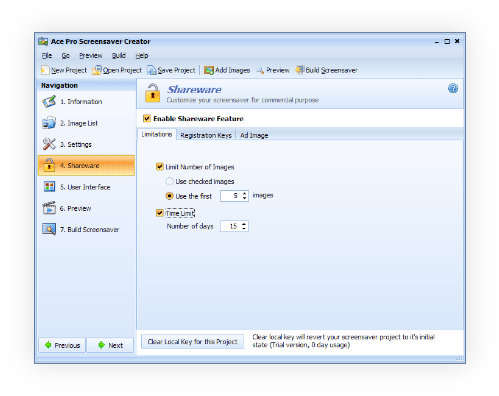 For business users Ace Pro Screensaver Creator comes with must-have features that help you make screensavers for marketing or sale. 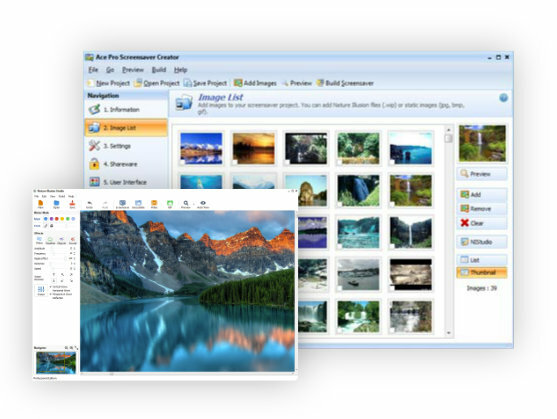 Ace Pro Screensaver Creator supports most popular graphic formats such as JPEG, GIF, PNG, TIFF, BMP, and so on. It also supports animated photos created with our popular app Nature Illusion Studio. 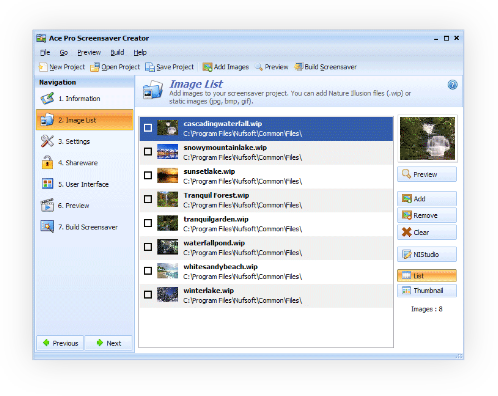 Ace Pro Screensaver Creator provides a complete set of commercial features so you can start selling your screensaver in no time. Build trial screensavers for your users, set how many days your screensaver will run or limit the number of pictures. When they buy it, send an unlock key to remove the trial limitations and convert it into full version. You don’t have to explain to your users how to install and activate screensavers because our app has built-in installer packager. That’s right! Your users just need to run the installation file and they are ready to enjoy your screensavers. Jpeg, gif, png, tiff, and other most popular image formats. Add mp3, wmv files as a background music. Set display interval between images. Show transition effects between images. Limit the number of days in trial version. Limit the number of pictures in trial version. Generate registration keys for unlocking trial version. Ad image to promote your screensaver. Customize your screensaver settings skin. Set a screen or window to show when screensaver is in trial mode. Set a screen or window to show when screensaver expired. Edit skin with built-in Skin Editor. Preview what you will see in trial and full version. 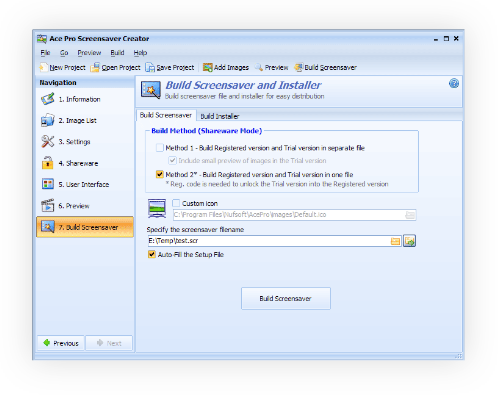 Build screensaver with registration key support. Build trial and full version screensaver in separate files. I downloaded a screensaver from Annie Reb, it was the most wonderful screensaver I ever saw (a river rapids) and it was made by your program. So I bought it thinking I could do as well. Well thanks, to you being so creative and smart. I have been playing with them ever since. I love your software and I have created a lot of nice screensavers for myself and my friends. I really love how easy your program is to work with and do not want to have to purchase another program. I really love the app because it is user friendly and although a picture is worth a thousand words and photos are memories, you guys have brought the photo memories to another level as you have added virtual life to them. I love the fact that we can now add animations to our screensavers and I am more then sure that my customers will enjoy this. I really do love your screensaver maker app, and my clients love it as well. The screensavers make great advertising for new developments/subdivision, etc. Just discovered your screensaver creator. I find them some–if not all–of the best and most beautiful photos of water scenes I’ve ever run across. Thank you for making them available to one who truly appreciates them. Ace Pro Screensaver Creator is my very favorite screen saver creating program. And with the great support and upgrades, it just gets better all the time. I purchased Ace Pro Screensaver Creator in 2003, and I still consider it the best water effect screensaver creator out there. It is easy to use, has the best water effects, and the customer support is absolutely fabulous. I own several other screensaver creators but this one is at the top of my list!